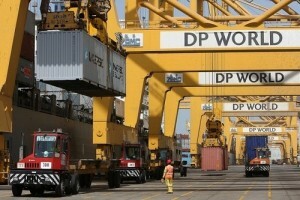 In the presence of His Highness Sheikh Mohamed bin Zayed Al Nahyan, Crown Prince of Abu Dhabi and Deputy Supreme Commander of the UAE Armed Forces, DP World today announced that it will invest in two projects at Chinese ports at a cost of US$1.9 billion. DP has signed the agreement at a cost of US$636 million to build a smart container terminal in the Port of Qingdao which depends on remote handling, and is the first of its kind project in China. Work on this project will end during 2017. The second project is the construction of a new port in Tianjin City at a cost of US$1.2 billion which is expected to be completed in 2018. Sultan bin Sulayem, Chairman of DP World and Qingdao Port Group signed the agreement. Among those who attended signing of the agreement were Dr. Amal Abdullah Al Qubaisi, Speaker of Federal National Council (FNC), H.H. Lt. General Sheikh Saif bin Zayed Al Nahyan, Deputy Prime Minister and Minister of the Interior, H.H. Sheikh Hamed bin Zayed Al Nahyan, Chief of the Abu Dhabi Crown Prince’s Court, the accompanying delegation of Sheikh Mohamed and Mayor of Shanghai, Yang Xiong.